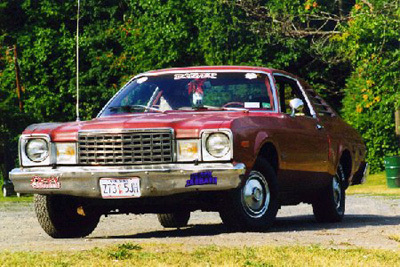 The first car I drove was a 1979 Plymouth Volare. I was 16-years-old, and my school district had cut busing as a cost reduction effort. It was my Grandma's car, but she could no longer drive, so my dad bought it from her for me to drive. It eventually died on me in a Taco Bell parking lot, an hour away from home, while my parents were out of town & my brother was away at college. I ended up walking three blocks to the church and calling one of my cousins, who drove me home. My parents came back after they got home, and had it towed to a junkyard. My parents had recently bought a new car, and the Volare had died, so this became "my" car to drive. I eventually ended up buying it from my parents and it actually became my first car. It was a great car, but was totalled in an auto accident in 2002. Yes, the same accident in which I was injured. Luckily for me, the "totalling" was mostly external damage. The passenger side mirror was ripped off, and the passenger side back seat door would no longer open. The driver side rear door was bent in so far that there was a gap between the top of the door and the car's frame. We stuffed plastic into the crack and duct-taped all along the door opening (classy, I know). But I was poor, and now fighting with the insurance company over mounting medical bills. So I did what I had to do. This was the first car I ever bought on my own. I remember we'd been looking at cars for three days, but when I sat in this one, I actually got giddy. It was my car. It had to be. When we found out we were pregnant, FireMan decided to trade in his Toyota Tundra for something more practical for a family (cue the "awwwwwwww............."). I have to say, I miss the truck, but at the same time I love my RAV. Also - this is the first car we bought together, and the only vehicle we own that has both of our names on the title. It's primary use is for the business. In fact, he's installed tool boxes along the walls in the back, and it also holds his pump-testing equipment. Currently it is a personal vehicle, but we are seriously considering having it licensed and insured as a business vehicle within the year. There are pros & cons to both ways of doing it, so... final decision hasn't been made yet. You've had quite the variety of vehicles. There's something about driving an SUV, though, that I have a fondness in my heart for. I miss my SUV!! You sure have lots of experience with cars! Being able to drive cars of different types and features became your deciding factor on choosing a car that you will you be using in the long run. Which one of these is your favorite? If you’d ask me, my vote goes to the 2004 Toyota RAV4. It is very spacious, and its performance is really awesome. Have you decided on what you’d do with “Fireman”?